Day three started out simple enough. At 4:30 or so I was awakened by the alarm on Sam's O2 sensor going off. Sometime in the night her oxygen mask had slipped off and her oxygen saturation had dipped into the mid 80s. I slid her mask back on and then watched it creep back up to 90. Being unable to fall back asleep, I got up and did some writing on my new Macbook Pro (Thank you Alicia!). I'll write about that more at another time. I submitted an article to a newsletter, wrote a blog post, and worked on getting my computer set up the way I wanted it. Around 8:00am Q came in and talked about Sam's situation. 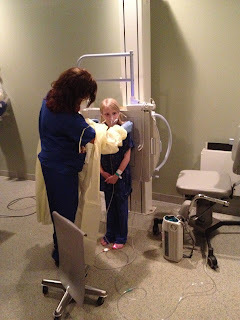 Q is the primary CF doctor at Childrens and she's awesome! 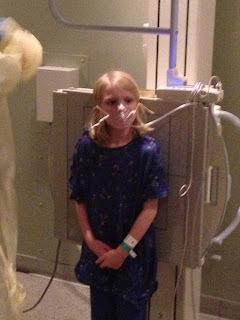 She spoke very honestly and openly with me about her concerns for Sam's status; most notably that she still needed oxygen in order to keep her saturation up. Everyone had hoped that by day 3 Sam would be able to breath well enough on her own to not need it. We had already been informed by Q that she suspected a collapsed lung. Actually, only part of her right lung was collapsed. This was cause for some concern, but really no one was too bothered. They just needed her lungs to be opened up more, move the mucus out, and then all would be perfect again. The problem, however, was that Sam's O2 stats were so far off of what they wanted that Q thought they needed a new x-ray. A half hour later, Sam was bravely standing in front of the machine and got her pictures taken. While I waited outside the x-ray room, another patient rounded the turn, pushed by his father with the nurse walking next to them. The dad and I exchanged nods of our heads in mutual respect. As soon as we got back up to the room, Q was reading the x-ray. A few minutes later, she asked me to join her outside at the nearby computer station. It was there that she told me that another part of Sam's lungs had collapsed. We were now dealing with at least two fairly large parts of her lungs not being used by her body. Small wonder that she had such bad oxygen stats! What this also meant was that things weren't getting better. Q reassured me that they had plenty of steps left before anyone would be worried. She tweaked a few things, mostly to avoid causing more asthmatic exacerbations while getting more medicine in her to fix the problem. She doubled her vest treatments to 4 and kept the 2 IPV treatments from the previous day. In addition, she switched part of the albuterol treatments to a different drug called Atrovent. Part of this was due to the fact that albuterol irritates her lungs in an asthmatic manner, which leads to flareups. When Alicia, Timothy, and Sam got to the room, Sam perked up for a little bit, and then around 7:00pm, her attitude began to sink. That's right about the same time that it started the previous night. We are now starting to notice a trend. Part of it, unfortunately, is due to the night respiratory therapist. I know you shouldn't talk bad about people who are helping you, but this guy has no bedside manner and honestly isn't the best at what he does. It's very frustrating. I don't tolerate Sam being mouthy toward him, but inside, we do understand her feelings. So Day 3 was rough, but we look forward to better things for Day 4. Hopefully the treatments work!